Duxford's Spring Air Show is traditionally themed, with flying and static displays inspired by a subject chosen to suit the theme. Since 2017 the theme has been simply 'Festival', allowing a wide variety of aircraft types to display, mostly from the UK but with a significant contribution from abroad. The first of the teams from abroad to be announced was the Breitling Jet Team, who will be Back at IWM Duxford for the first time in 14 years. The Breitling Jet Team fly seven L-39C Albatros high performance jet trainers at speeds up to 700km/h and pass each other with only three metres to spare. The first British team to be annnounced were the RAF Chinook Display Team, who will perform public displays at just 13 venues this season. The Chinook helicopter is remarkably agile even whilst carrying up to ten tonnes in supplies: around the same weight as four Range Rovers. Most of the aircraft in the flying displays are also on static display and could be seen on the flightline walk before the show. A highlight of the 2018 Duxford Air Festival was a trio of contributions from the French Air Force. The Patrouille de France last flew at Duxford during the D-Day Anniversary show in 2014 and returned, on Sunday only, for their only UK appearance of the season. The other two teams from France displayed on both days. 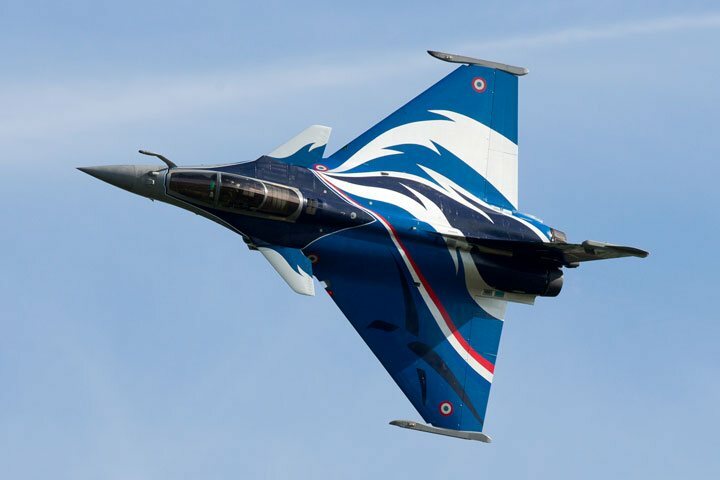 The Dassault Rafale returned after last year's success, sporting its new 2018 livery, seen for the first time in the UK. The third display from L‘Armée De L‘air was the first appearance at the Duxford Air Festival of the aerobatic Equipe de Voltige. Duxford's Spring Air Show is usually themed, with flying and static displays inspired by a subject chosen for the season. However, for 2017 the theme was simply 'Festival', celebrating the Imperial War Museum's 100 years with a huge variety of flying, mostly from the UK but with a significant contribution from abroad. One such non-UK contribution was, arguably, the star of the show, raising huge applause from the crowds. 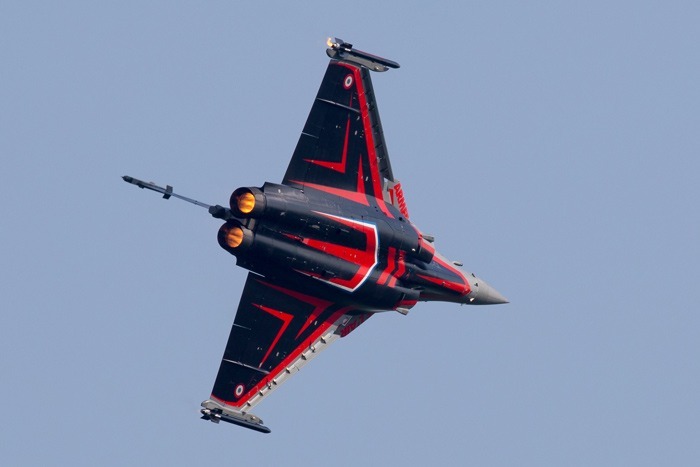 This major highlight was the Rafale Solo Display from the French Air Force. Capt Jean-Guillaume "Marty" Martinez, in his second year as the Rafale solo display pilot, gave a spirited, high-energy display within a tight box, never out of the view of spectators. The spectacle was enhanced by the striking livery of the jet which did, let's be honest, make the British Typhoon appear rather bland. The Saturday display at Duxford was the first UK appearance by the team this season and one of only two UK shows to get the Rafale in 2017 - quite a coup for the Duxford team. Another highlight was the Sea Vixen. 'Foxy Lady' had been due to fly at Abingdon a fortnight earlier but neither the aircraft nor the team were ready, principally because of technical issues. The Duxford Air Festival's Saturday display was consequently its inaugural public appearance of the year and the first display since it curtailed one in Eastbourne last August following discovery of an issue with a flap. The display by Cdr Simon Hargreaves was superb but unfortunately the aircraft suffered an hydraulic failure when it returned to base at RNAS Yeovilton and made a wheels-up landing. 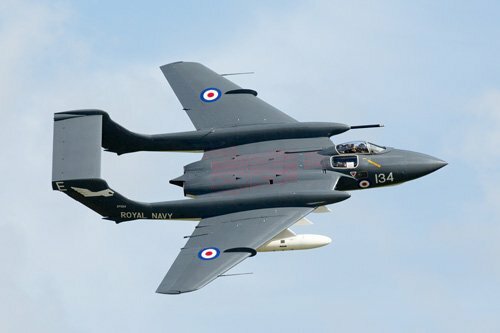 The pilot is OK but the Sea Vixen was damaged and was inevitably not able to return to display at Duxford on Sunday. The rest of the programme went more-or-less according to plan but there were a few exceptions. A minor technical problem was soon fixed but an off-site traffic incident prevented the MiG-15 flying on Sunday - a huge shame for the crowd to miss such a great aircraft - but most of the changes affected Saturday's schedule. 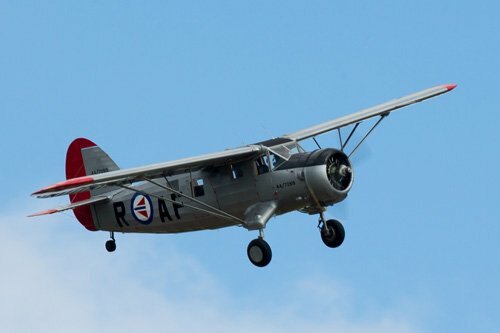 The wet start gave way to dry conditions by the time flying started but a wind around 20 knots, gusting to 25 knots, meant that the Falcons arrived in their Skyvan rather than jumping from it and both the Dragon Rapide and the Sopwith Pup stayed on the ground. Happily, for those who attended for the whole weekend, both were able to fly on Sunday. The outing of the Historic Aircraft Collection's Sopwith Pup replica on Sunday, in the hands of Roger 'Dodge' Bailey, Chief Pilot of the Shuttleworth Collection, was its maiden public display. The aircraft represents N6161, from which some original parts, together with other original Sopwith factory and Sopwith Pup components, were incorporated in the 4-year re-construction by Retrotec, part of the Historic Aircraft Collection based at Duxford. Another Duxford débutante was the Norwegian Spitfire Foundation's Noorduyn UC-64 Norseman. Not only was this the first flight of this particular aircraft at a UK airshow, but probably the first time any of this type has flown from Duxford since the second world war. Shows at Duxford are famous for displays of warbirds, especially the fighters and bombers that are better known to most attendees, but the Norseman was a Festival highlight both for its novelty and for the superb presentation of this relatively modest utility aircraft in its fresh Royal Norwegian Air Force livery. The Norseman is remembered as the type of aircraft in which bandleader Glen Miller went missing on his way to organise a concert in France, so the commentary was accompanied by the band's music and some speculation that Glen Miller's plane may have been lost because of carburettor icing or because it was hit by munitions being jettisoned from returning bombers. Flying with the Norseman was the Aircraft Restoration Company's de Havilland Canada DHC_2 Beaver, resplendent in its red, while and green civilian markings. 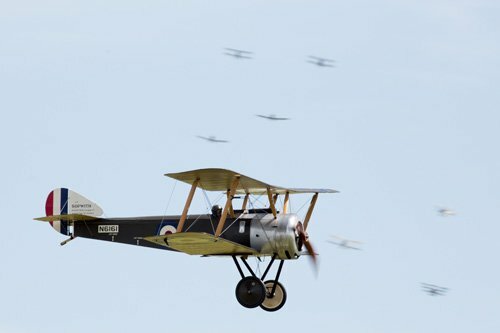 The Pup was the most anticipated, but not the only WWI replica flying, joined on the programme by eight of the Great War Display Team's aircraft whose upgraded display for 2017 began with tailchases in pairs against a background of pyrotechnics to simulate bombing, strafing and a WWI dogfight, ending with an opposition pass. Their display on Sunday was on slot, but on Saturday it was delayed to the end of the afternoon when the strong gusts had subsided sufficiently for the display to go ahead safely. Quite a logistical accomplishment to rearrange such a large display involving so many aircraft, and full credit to the pilots and the new Flying Display Director who has taken over the reins from recently-retired Jeanne Frazer. One change that was not weather-related was the substitution of the second Strikemaster, which is not yet ready to display, by Jeff Bell's Jet Provost T5. 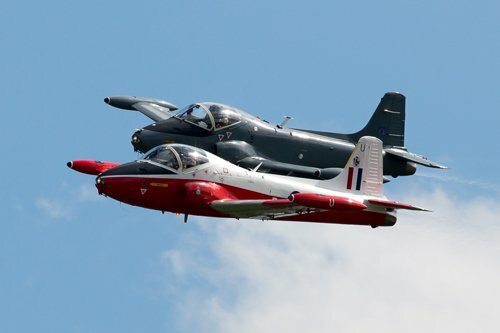 Ollie Suckling flew the Provost and Mark Petrie the Strikemaster in typically fluent style, reminiscent of the Jet Provost pairs displays of the 2016 season. It was novel to see the inter-war racers at Duxford. The world's only DeHavilland DH88 Comet from the Shuttleworth Collection, a two-seater designed and constructed specifically for the MacRobertson England to Australia Air Race, flew with the Collection's original, and David Beale's replica, Percival Mew Gulls. Frequently seen at the nearby Shuttleworth Collection airshows it is less common to see any of these classics away from Old Warden. From the same era, Dan Griffiths flew Shipping and Airline's Biggin Hill-based DH90 Dragonfly on both days, joined by Mark Miller in D & M Miller's Dragon Rapide in Sunday's kinder wind conditions. There was plenty of family flying entertainment, too. 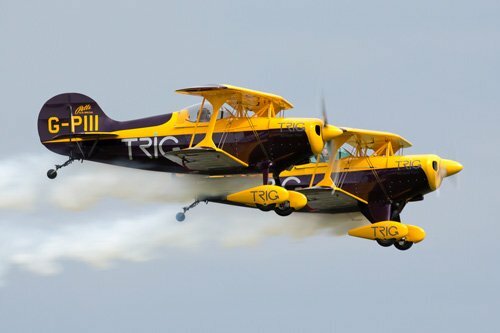 The most polished display came from the impeccable Trig Team of Richard Grace and Dave Puleston in their striking yellow and black Pitts S-1D Specials. Their close-formation aerobatics are always a treat to watch but even anyone who is not a fan of light-aircraft aerobatics must surely have admired the skill of this pair, especially in the gusts on Saturday, which would have kept many teams on the ground. Other light aerobatic displays came from the Blades, who did their usual thing; the Breitling Walkers who laid their normal smokescreen through which it was sometimes possible to see newbies Gina Marshall and Katie Hobbs atop the wings of their respective Stearman biplanes, and Peter Troy-Davies in the Rotorsport Calidus Autogyro. There is no doubting the skill of the pilot nor the flexibility of his autogyro, but we have to question whether a venue such as Duxford, with its long crowd line, is best suited to such a diminutive aircraft. The commentators, control tower and people in the posh seats were able to appreciate its gyrations, but it was a distant wonder to anyone beyond the central element of the crowdline. Most of the aircraft were also on static display for a couple of hours before the flying started, so for £6 there was a chance to get really close to them in the flightline walk. Also on static display was a Bell Boeing CV-22B Osprey, based at nearby RAF Mildenhall. Although there was no flying display, this huge tiltrotor did demonstrate its capabilities to those who happened to be in the right place at the right time and was in a spacious exhibition area where its crew were able to explain its flexibility as a vertical or short take-off, long range, high-altitude, high-speed blend of helicopter and turboprop aircraft. Exhibited nearby was the Army Air Corps' AgustaWestland WAH-64D Apache AH1 supporting the first public appearance in 2017 of a flying display by the Attack Helicopter Display Team. As last year, the AHDT display was a solo but very impressive nevertheless, beginning with a role play in which the Gunship destroyed an enemy position in support of ground troops, sliding into an exhibition of the Apache's capabilities and ending with their signature 'hover in front of a wall of fire' finale - which you had to be crowd-centre to appreciate. On Sunday the display Apache developed a technical fault, but after a short delay the second example from the static display was pressed into service and the display went ahead. The army were also a bit luckier than the RAF with the weather when it was their turn to demonstrate the service's parachuting skills on Sunday. The Parachute Regiment's Freefall Display Team, the Red Devils, jumped from a Britten-Norman Islander at 4,500 feet, not to a central point, but to various landing spots along the crowdline to give more people a chance to see them. During the display Cpl Mike French jumped with the Regimental Flag and LCpl Chris Sharman descended with a 2,000 Sq Ft Union Flag. But one of the most important deliveries was an engagement ring, with which the IWM's Executive Director, Graeme Etheridge, proposed to Catherine. She accepted. In the absence of the Falcons on Saturday, the RAF's sole appearance was the first public display by the new Eurofighter Typhoon FGR4 display pilot, Flt Lt Ryan Lawton. 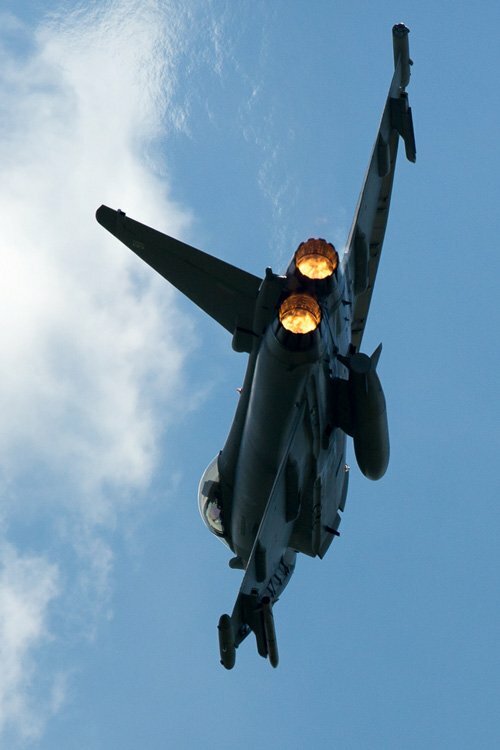 The Typhoon display evolves each year and Ryan's has built on Flt Lt Mark Long's 2016 display, keeping it in a tight space in front of the crowd yet still demonstrating the agility and responsiveness of the UK's primary swing-role combat aircraft. As well as the flying, there were living history re-enactments, sounds of the era including live music and access to all of the museums on site. A bonus this year was a chance to see the Bloodhound Supersonic Car, designed and built in the UK, which is destined to achieve over 1,000 mph in a world land speed record attempt in South Africa and due to make its first ground run this coming October. The pattern of the show this year was a departure from earlier Spring airshows at Duxford, which have followed various themes but have relied heavily on resident aircraft. This year the popular locally-based warbirds were certainly not forgotten: favourites Sally B, accompanied by Anglia Aircraft Restorations' Mustang 'Miss Velma'; Plane Sailing's Catalina and the Museum's Spitfire Mk 1a 'N3200' flying alongside Comanche Fighters' Mk 1a 'X4650' represented the Duxford-based contingent and its historical links with the US and Royal Air Forces; but the balance between resident and visiting aircraft was reset in favour of visitors. The extent to which the audience appreciated this change will inevitably have varied. It should have answered those critics of spring shows in earlier years who have suggested a sense of deja-vu: same planes different order. On the other hand it will have disappointed fans of the classic aircraft that were invisible in hangars whilst family favourites commanded the airspace. We think the organisers got it right. The flying list was available in good time for all to see, so those who wanted to see more of the resident warbirds will have known what to expect. There were still gems such as the Noorduyn, Sopwith Pup, Comet, Sea Vixen and Rafale to enjoy. If that was not enough they could save their energy for Flying Legends. Those local people who find it less easy to visit seaside shows will have appreciated the family displays. Either way, the 'same old ...' label could certainly not be applied to the 2017 Festival. 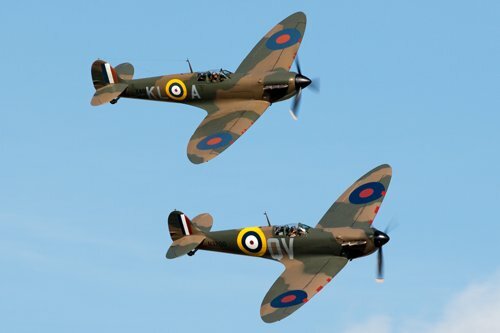 With aircraft from most eras, including the first war, the second war, inter-war, cold war and modern; with no fewer than six jets on the agenda and several débuts, variety was the name of the game. It may not have pleased everyone but it was truly an air 'Festival' at Duxford. The programme for the event was a rather hefty £8. It was well produced and very informative but one has to wonder how high the cost of a programme will go and how many more would be sold if it returned to the price levels of recent years. Add the cost of parking (£5), £6 for the Flightline Walk and the premium prices for refreshments, and this is certainly not a low-price venue. Nevertheless, with flying stretched to the best part of five hours each day and plenty else to see around the museum site from early in the day until an hour or so after the last display, shows at Duxford may not be low cost but they do offer excellent value.